You're here because you want your music to sound the very best it can. Let me personally help you achieve this, like I have for over 7,500 clients on over 40,000 songs since 1999! I'm also the author of the current #1 Best Selling Audio Mastering Book on Amazon. Let me use my 19 years of audio mastering experience to take your project to the next level! Only 50% down required. The rest due after you approve my work. 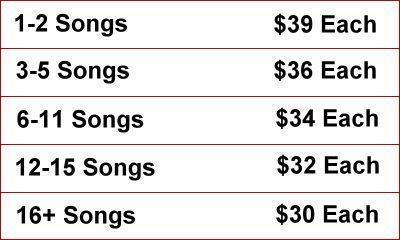 Two free revisions per song, after that it's only $5 each. Full CD projects usually finished in 3-5 business days. Only 50% Deposit To Start Your Project TODAY! Quickly Download Your DDP Image - No Waiting For Your CD To Arrive! Quickly Get Your Duplication Started And Save A Few Days Turnaround Time! NOTE - Get The Plastic CD Master Disks AND The DDP Image $50 ($65 International)! 1. If you still don't get what I'm asking for, how many files per song are you sending? Note: All emails, songs, and personal information submitted are 100% confidential.